It is not greed for person A to wish to retain that which person A has earned. It is greed for person B to wish to obtain from person A that which person B has not earned, but person A has. It is not greed that I wish to keep that which I have earned: it is greed for others to wish to take from me that which I have earned. This is the underlying principle of socialism and communism. They try very hard, chasing their tails and rewriting words to exclaim it’s greed for you to want that which you have earned. In fact: that is not greed, it is, however, greedy to want to take from others what those persons have earned simply because you yourself did not. They would frame capitalism as greed: however, capitalism is the free exchange of goods or services to mutual gain and benefit. I am not a “wage slave” nor am I being oppressed, extorted or exploited by my employer. I provide a service to my employer: for which they pay me an agreed upon monetary compensation per hour that I provide said service to them. I can work someplace else doing something else, my participation in the exchange of service for monetary gain is voluntary. If I offer to pay a monetary allotment to person A in exchange that they wash my car: they either do it or they do not. I have not exploited them, enslaved them, extorted them or oppressed them. If the allotment of money I have offered to perform said task is more valuable than the volume of time it would take for them to complete the task and the effort to perform that task is also less than they value the monetary allotment I offer – they take the job, perform the work and get paid. This is a voluntary exchange. Socialism would paint this as each of the above mentioned terms: extortion, exploitation, oppression and enslavement. Horse manure: they’re preaching false narratives in order to instill a system where no one is permitted to have such a difference in relative wealth that one person would be capable of offering work in that manner. So that someone need not EARN their living, they can simply be provided from the wealth taken from someone else. 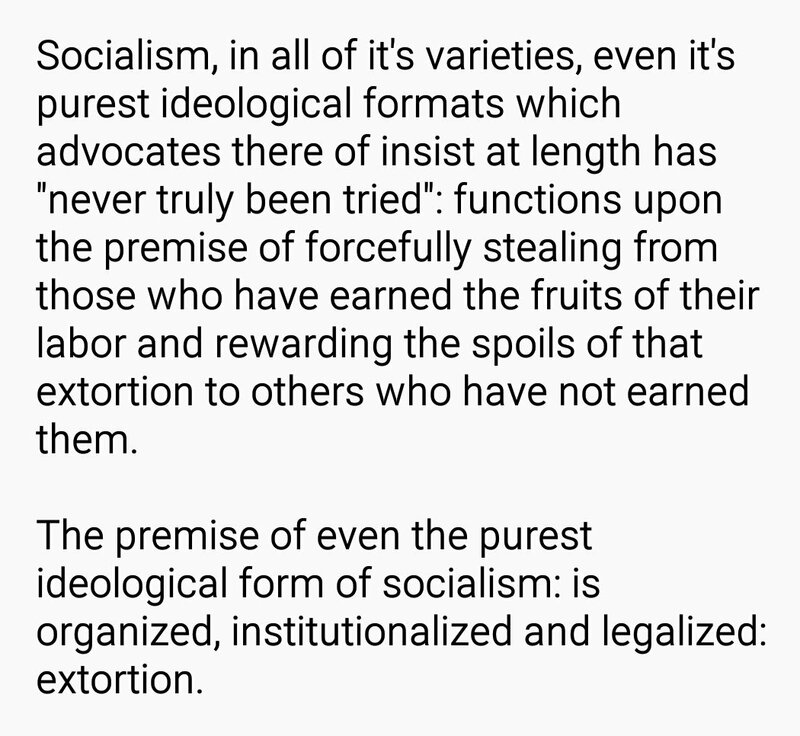 Socialism is an enterprise of espousing that no one need be poor if a powerful entity (the state) simply steal from those who have wealth. The basic premise of socialism: is institutionalized greed. Greed on the part of those who want not to earn their living, but wish to be provided for it by sending a militant force to steal it for them. I barely make $20k a year, I have no health insurance because I can’t afford it and it’s cheaper to pay the fine for not having it. Unlike the spoiled rich kids who call people “bourgeoisie” while wearing $250 shoes and recording their political opponents on $400 phones: I’m an actual member of the proletariat. I’m still not a socialist because I’m not greedy: I’m a Capitalist, I don’t steal from others, I earn my living.